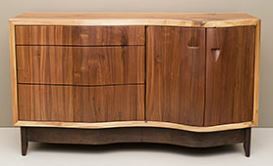 The Joutras Gallery at the Chicago Botanic Garden is showcasing furniture and accessories crafted from hardwoods culled from area urban forests by eight wood artisans. Participating artists include Kelly Bresnahan, Greta de Parry, Michael Doerr, Celia Greiner, Mike Jarvi, Matthew Osborn, Lou Pignolet, and Sean “Lucky” Rice. The exhibit also include tree trunk specimens milled by Horigan Urban Forest Products of Skokie, IL. The exhibit runs through Aug. 21. The Chicago Botanic Gardens is located at 1000 Lake Cook Road in Glencoe.